You can wear these Kenneth Jay Lane Giraffe Bracelets and Animal Jewelry day or night. 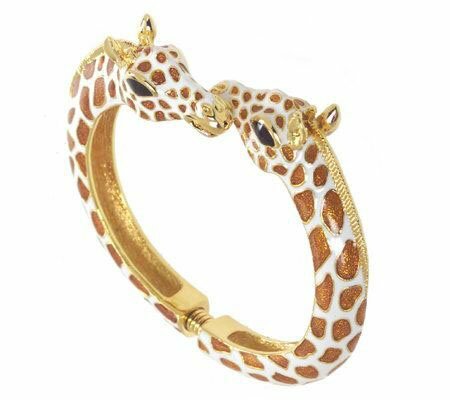 The Giraffe Bracelet is a must for anyone wanting to add a little animal jewelry to their wardrobe. You'll never want to take the Giraffe Bracelet off with the all the attention you will be getting. Kenneth Jay Lane makes Animal Jewelry, specifically the Giraffe Bracelet, a classic and stylish look. Giraffe Bracelets and Animal Jewelry are truly the perfect attention getters in any season. This Animal Jewelry is enameled and comes in the shape of a giraffe, an elephant, a leopard, a tiger and a snake. One day you may feel like a lively leopard and the next day an elegant giraffe. A Giraffe Bracelet makes anyone's day brighter it bring out the kids in all of us. Try this chic yet fun Giraffe Bracelet today. Giraffe Bracelet opens with hinge so one size fits most. 3" diameter. If you're a lover of giraffes, snake prints, zebra stripes and leopard spots, you'll go crazy over these Giraffe Bracelets. These statement Giraffe Bracelets are a great substitute to the usual animal print, particularly if you feel like showing your chic giraffe side. Wear the Giraffe Bracelet by itself as a main piece, or pair it with matching simple bangles.